Maintenance work takes place in front of the forthcoming Asahi Japanese Steakhouse at the Delaware Square Shopping Center in a recent photo. 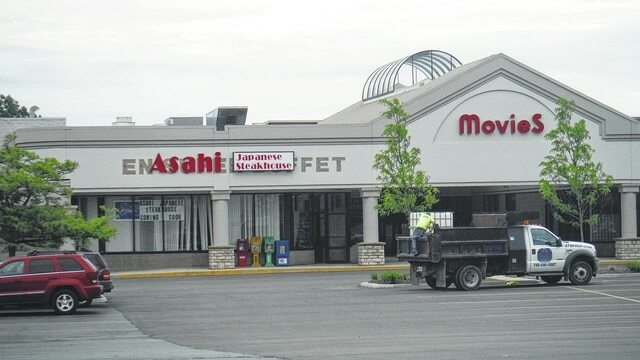 Asahi, a new restaurant, is coming soon to Delaware Square Shopping Center on U.S. 23. Asahi will go into the space formerly occupied by EN Super Buffet. In addition, the center’s Spa & Nails salon is expanding. The salon is unique in that it serves alcohol to its clients. Two other existing businesses, Comfort Dental and Fred Astaire Dance Studios, are also interested in expanding in the center, he said. The most prominent part of Delaware Square, the former five-screen movie theater complex with a covered skylight, remains empty. DeVicchio said operators have expressed interest in the space. Delaware Square is 70,000 square feet of space, states the devicchioassociatesinc.com website. DeVicchio said the 15,591 square-foot theater; a 13,000 square-foot former Jo-Ann Fabrics; and three other spaces totaling 7,800 square feet are available. “We want to lease the center out, we want it full and continuing to look good,” he said. A Long John Silver restaurant that was in the center’s parking lot closed in April, but the out-parcel had a different owner.